Bette Midler photographed by Jonathan Pushnik. 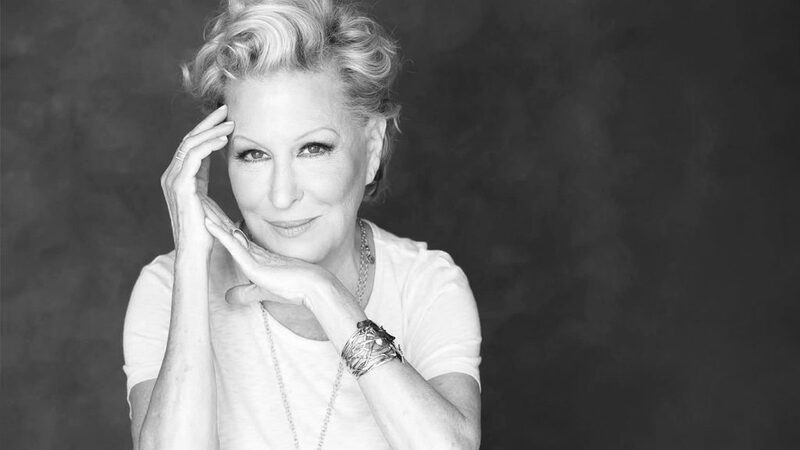 Next up in our Digital Dialogues series of archival podcasts is Bette Midler. 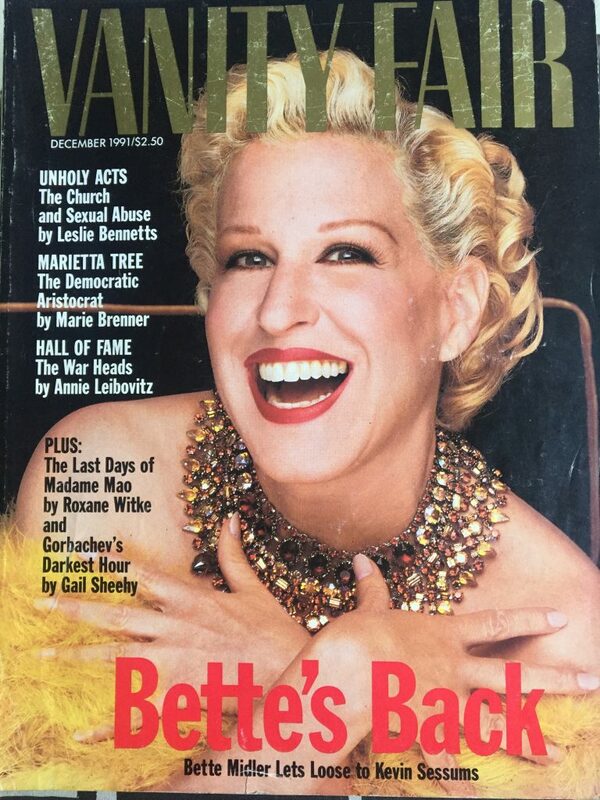 I interviewed Bette back in 1991 for the cover of Vanity Fair when she was about to open in the film For the Boys, director Mark Rydell’s musical drama set during the Korean and Vietnam wars which limns the story of the contentious relationship of two show biz troupers – a 1940s actress and singer known as Dixie Leonard, portrayed by Midler, and Eddie Sparks, a vaudevillian-like performer who bobs about onstage with a kind of hyped-up hope who is played by James Caan. The musical numbers are mostly staged as USO turns when Leonard and Sparks entertain the troops together during those two wars. The film wasn’t a commercial success but has correctly achieved its place as a cult classic for those who love movie musicals. Midler is magnificent in it and received an Academy Award nomination for Best Actress for her portrayal of Dixie. This part of the podcast takes place in the living room of Bette’s home in Beverly Hills – well, “Beverly Hills Post Office,” as she corrected me with a kind of humility that itself was as endearingly hyped-up as the hope that Caan displayed as Sparks in For the Boys. The day before, Bette and I had had lunch together at Disney in the then new Michael Graves building where the studio’s commissary was housed. At one of the neighboring tables were Michael Eisner, Disney’s then Chairman and CEO, and his wife Jane who were accompanied by one of Disney’s biggest shareholders at the time, Sid Bass and his wife Mercedes. The podcast opens with our talking about Mercedes and Bette’s impressions of her. Because it takes place back in 1991 – and proving its archival bona fides – she also talks about having recently met Gene Kelly and Billy Wilder. Indeed, Midler, who recently turned 72 and is a show biz legend herself but still one in a heyday all her own, is a bridge to other legendary Hollywood artists of the past who have passed on. My cover story on Bette Midler. Photographed by Firooz Zahedi. 1991. I adored my time with her out in Hollywood and “Beverly Hills Post Office” and on the set of For the Boys as I watched her artistry up-close and in close-up. But our own relationship became a bit contentious after the story in Vanity Fair came out. “Want to touch it?” I asked her. “No,” came her immediate reply, shocked a bit even that I would ask such a thing right off-the-bat. But I’d learned early on at Vanity Fair to do something like that to throw my subjects off a bit and let them know this was not going to be the normal interview process for them. Midler met von Haselberg in 1981 at a Los Angeles club called the Roxy, where they went with mutual friends to see a concert by King Crimson. Two years later they ran into each other again at the old Lhasa Club in LA, and this time she gave him her home telephone number. One year later he worked up the nerve to call her, and they attended an Eric Bogosian performance. Six weeks after that, they were married by a part-time Elvis impersonator in a Las Vegas wedding chapel to the accompaniment of the sound track to Fellini’s Juliet of the Spirits. For the next two months, they lived in separate houses. “I hardly knew him!” is how Midler explained such a conjugal curiosity. I kept the sentence. Puff pieces? I’d show them a bit more impertinence. I was both shocked and rather impressed: I had just been “read” by Bette Midler. I saw her a few times after that in our local cafe downstairs from my own loft. It was always around 8 a.m. She seemed to have just rolled out of bed. And it was always the same. I’d try to engage her and she’d grunt at me without really saying anything. She obviously disdained me. I assumed it was about that one impertinent sentence. Then one day she stutter-stepped into the cafe after I had seen a screening the night before of The First Wives Club. “Morning, Bette!” I called to her. I gave up. I turned back to my espresso and my croissant and that morning’s New York Times. Suddenly the sound of those stutter-steps were coming my way – a little snare drum snarl with a beat all its own. There, standing akimbo, was Bette Midler at my table. “Yes …” I began to answer. 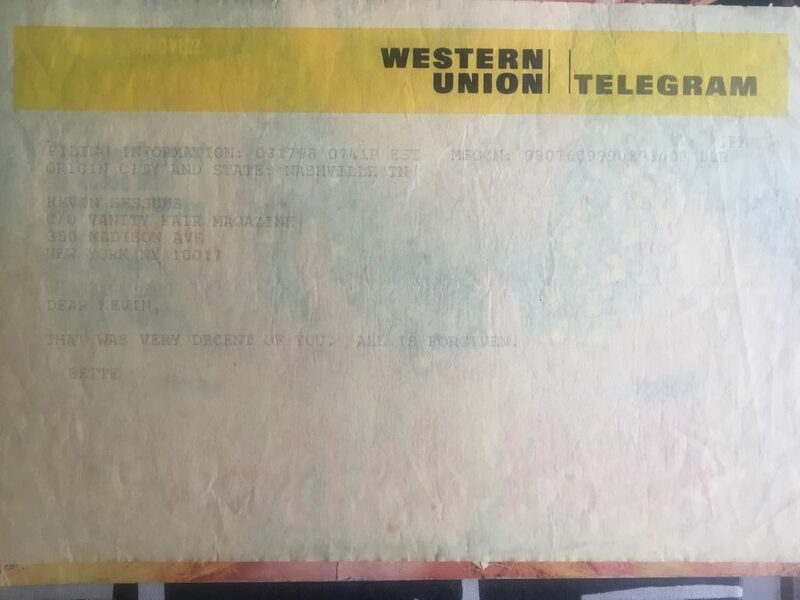 The Western Union telegram I received from Midler proclaiming her forgiveness of me. I watched her stutter-step out the door and, I thought, out of my life. The week after the Vanity Fair issue with Bette’s Hall of Fame page in it, my downstairs buzzer buzzed. I pushed the intercom button and asked who it was. “Western Union,” came the disembodied voice. “What?” I asked, wondering if someone were playing a joke on me. Enjoy, the podcast. I hope Bette doesn’t mind my running it. And if she does, I hope she forgives me.